Libertarian Party candidate Gary Johnson’s only somewhat tongue-in-cheek answer to the question many Americans are mulling over echoes the views of a huge chunk of voters. This US presidential election has churned out the two of the worst candidates the country has ever seen, boasting favorability ratings of roughly -60% each. And is it any surprise? Hillary Clinton’s campaign has been dogged by various controversies revolving around the FBI investigation into her emails. Although they proved her innocence, she did not survive well. She was portrayed as either incompetent, a liar, or both. During her time as Secretary of State, Clinton used 8 different blackberries and 5 ipads. None of them could be found for inspection and this seems suspicious in these circumstances. Add to that the controversies surrounding the Clinton Foundation and the allegations of ‘pay to play’. It’s little wonder she is struggling. Also, there is the general sense that Hillary believes that being President is somehow her entitlement. This only causes animosity amongst people. Some of that ties into her declaration just a few days ago – now partially retracted – that half of Trump supporters constituted a ‘basket of deplorables’. She dismissed almost a quarter of the electorate as xenophobes. We witnessed how effective that kind of condescension of the disenfranchised was during the EU Referendum. Recent health scare stories have hindered her credibility. No-one, bar the most ardent of Republicans, would begrudge her getting ill. She’s only human. But after first playing off the concerns about her health as a conspiracy, then claiming she collapsed due to heat exhaustion, it emerged that Clinton was in fact suffering from pneumonia. The sheer amount of campaigning she managed despite her illness would be impressive had she acknowledged it immediately. But by dismissing it and then down-playing it, Clinton did nothing to alleviate the perception that she is fundamentally deceitful. This is the sort of ridiculous, war-monging statement one would expect from Donald Trump. Speaking of whom, where to begin? It’s difficult to tell whether the vitriol Trump has espoused are sincerely held beliefs or whether or not he just believes whipping up that kind of hatred, and playing into that kind of fear, represents his best bet at becoming Commander In Chief. Because make no bones about it; Trump couldn’t care less about the plight of working class America. Much like Hillary, he just wants to be Mr President. Throw in the litany of misogynistic remarks this nutter has uttered during the campaign, and it’s small wonder Americans are despairing at the choice before them. Which is precisely where Gary Johnson comes in. He and his running mate, Bill Weld, are both former Republican governors who served in traditional Democrat states, getting re-elected with increased majorities. He’s running on a ticket of fiscal responsibility and social inclusion. He wants to cut taxes and legalise pot. What’s not to like? But let’s leave policy to one side for the moment. The biggest difference between Johnson and the candidates put forth by the two main parties is that the guy is a decent human being. He committed a rather sizeable gaffe last week, completely blanking when asked what he would do about the situation in Aleppo. But a subsequent interview later that day on The View (where he answered the Trump or Hilary question), and his official statement shortly afterwards, showed a humility and reasonableness that is completely missing from the other two candidates. “This morning, I began my day by setting aside any doubt that I’m human. Yes, I understand the dynamics of the Syrian conflict — I talk about them every day. But hit with “What about Aleppo?”, I immediately was thinking about an acronym, not the Syrian conflict. I blanked. It happens, and it will happen again during the course of this campaign. He explained the gaffe as just a momentary brain-freeze that everyone experiences, and he’s right. But equally he acknowledged that he should be held to a higher standard. There was no excuse for the error, no attempt to blame the media. Just an honest ‘mea culpa’. This humility is a running theme with Johnson. Several times when discussing the principles that underpin his politics he can be heard saying the phrase ‘I could be wrong’. How many politicians do we hear saying that? There is surely no greater sign of intelligence than being able to admit when one has erred and change tack. That is precisely the kind of quality we wish to see in our leaders, rather than grandiose pig-headedness. Throw in his policies on being pro-gay marriage, pro-choice, pro-free trade, anti-regime change and military interventions, and wanting to make it as easy as possible for immigrants to acquire a work visa to enter the country, and there’s a strong thread of humanity that runs throughout his politics. Sure, he’s not perfect. 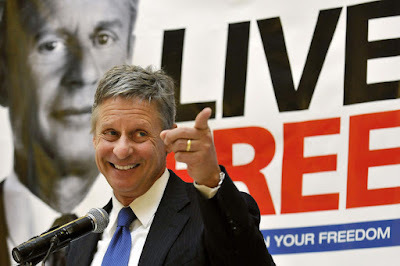 But all this culminates in the sense that Gary Johnson wants to be President because he wants to serve his country, not because he just wants to be President. And, gun to your head, doesn’t that make him the best choice for the job?